DUSKY flathead aren’t known as being big travellers, however one fish tagged as part of NSW DPI’s Trophy Flathead program has been recorded as taking a pretty big swim from its home waters. Angler Duncan Crockett, fishing with Dan Guilfoyle, a member of the Lake Macquarie Trophy Flathead Tagging Team, caught and tagged the dusky at Fishery Point on November 14, 2017. The fish was measured at 85cm and was caught on a lure. It was released in good condition with Duncan and Dan remarking on the tag card that the fish “seemed to be heavily pregnant”. Just over four and a half months later (132 days to be exact), the fish was recaptured by Allan Roddom at Stockton Beach, about 41km north of the original capture site. 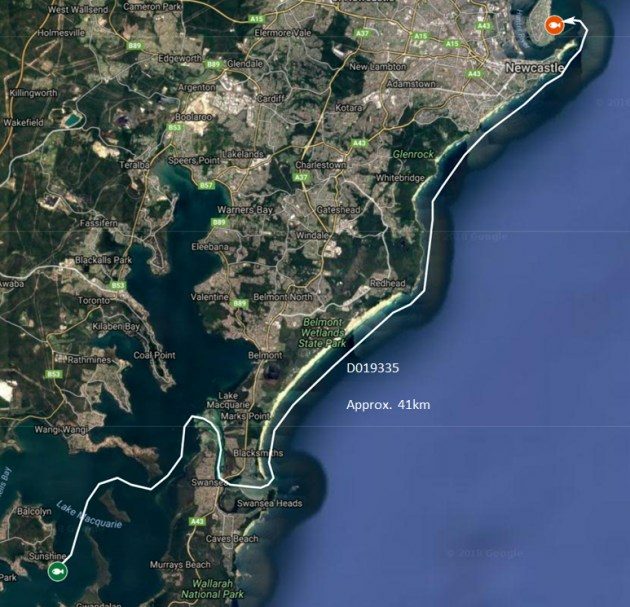 This shows the journey made by the tagged flattie from Lake Macquarie north past Newcastle to Stockton Beach. As you can see from the accompanying map, the peripatetic fish had swum across Lake Macquarie, out Swansea Channel, up Blacksmiths Beach, past Red Head, along Mereweather, past Newcastle and across the mouth of the Hunter River before moving in along Stockton Beach where it was caught by Allan from the beach on a piece of fresh yellowtail. Allan measured it at 87cm and remarked that the fish sported an impressive girth. Allan noted the tag number and re-released the fish as he thought it might have been in spawning condition. “This is the longest distance travelled so far by a dusky flathead tagged as part of the Trophy Flathead program,” Minister for Primary Industries, Niall Blair said. Lake Macquarie angler Duncan Crockett with the 85cm dusky before it went on its long swim north to Stockton! The Trophy Flathead program involves the tagging of fish over 70cm in St Georges Basin, Lake Macquarie and Tuross, all of which are Recreational Fishing Havens. Over 200 flathead have been tagged so far with multiple recaptures recorded. “The program is designed to help DPI researchers find out more about dusky flathead growth rates and movements and to assess the socio-economic importance of trophy-sized flathead,” Minister Blair said. The tagging component of the program is currently at capacity, however DPI needs more anglers in the three trophy fisheries to take part in a diary project to gather info on total flathead captures. If you’re interested in taking part on this important research project, please email research.angler@dpi.nsw.gov.au to receive a diary pack. Stay tuned for more info on DPI’s Trophy Flathead program as it is likely that more recaptures will be recorded over coming months and years.